Wednesday we had a circulation charette to design the specific areas that the main traffic flow would be happening. The point was to design the users experience in these spaces especially significant places in the facility. Whether the user is entering or leaving the facility, their experience should be considered and the design should provide interest in arrival and departure. 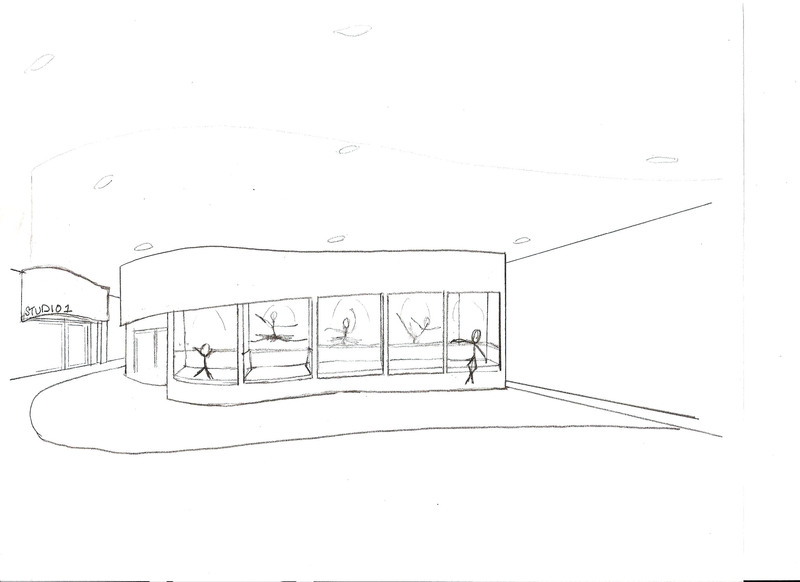 The sketch is of an open area in front of a medium sized dance studio. The wall will be constructed of two way mirror in 8′ x 4′ sheets. The viewers will be able to see into the studio, but the dancers will not see people watching them. They will only see themselves. On the exterior, there will be booth-style window seats that will have partitions where the breaks in the mirror are to hide that on the exterior of the room. The “window” seats will be lower than typical seats, at 14″ height, allowing a younger crowed to climb up in them and view the dancers. The cushions will protect people from leaning into the actual mirror. The soffit will angle down toward the left and wrap around into the corridor. The floor pattern will follow the shape of the space and will be carpet in the viewing area and Armstrong Striations BioBased Tile in the hallways. 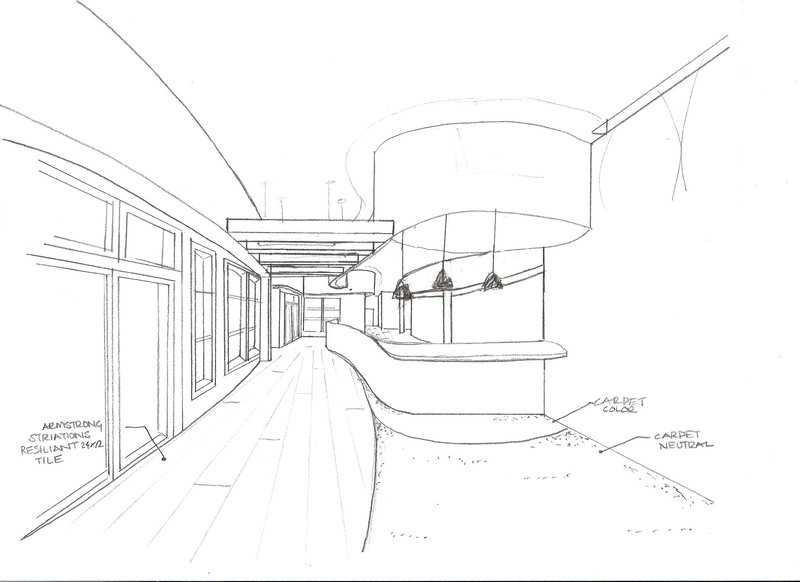 Entry’s to other studios will have curved soffits that engage the columns to incorporate them into the design. My second sketch was of the circulation space off of my arrival space that I designed on Monday. It is a large open area that I was confused on how to communicate movement. 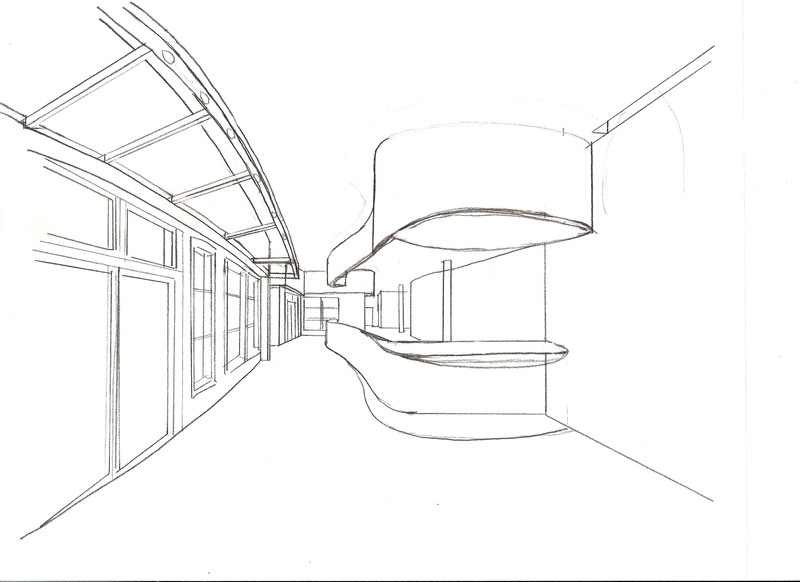 In this sketch I have dropped soffits down not only over the reception desk, but a soffit follows the length of the partition wall and mimics the curvilinear lines. This creates a space on the right side of it for the entry into the large performance studio. A soffit was dropped on the left side of the corridor as well to bring the space down to human scale. Architectural lighting will be used to highlight the curves and accent the ceiling. An awning type trellis is used to drop the corridor down to human scale. It has small recessed light fixtures that illuminate the passageway. This architectural element also bridges the interior with the exterior due to its feel and character. The doors lead to a large outdoor balcony, making this appropriate, while further communicating the concept of Unity. This image has the same soffit design as sketch #2, but implements another idea when it comes to communicating movement and way finding through the corridor. Small beams (smaller, thinner, and more delicate than drawn) will be suspended and used to create space in the corridors and communicate movement. Great work, Jessica and great sketches too! For the window seat type benches, you might consider them being 3 to 6″ thick benches spanning the space between the gyp. board wall partitions with open space below. The reason I say this is because it would allow a place for onlookers’ feet to go and bags could be tucked up underneath. If it is as you’ve drawn it, I think the wall could get severely damaged over time. On your arrival space, I’m still torn. I love both 2 & 3 ideas! I think you could incorporate either of these ideas into your circulation spaces too to tie the two together.